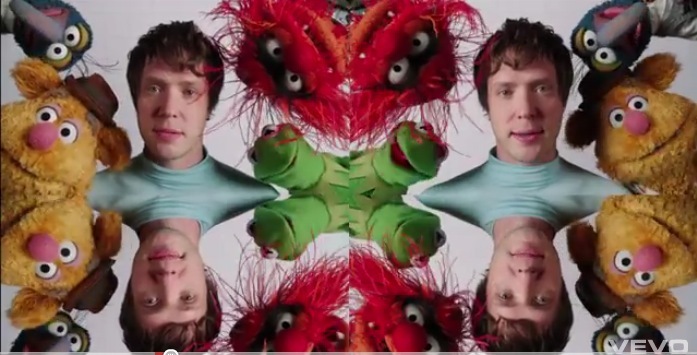 Quirky NY Chick: Video of the Day: OK Go and The Muppets - "Muppet Show Theme Song"
Video of the Day: OK Go and The Muppets - "Muppet Show Theme Song"
Today's video is from OK Go and the Muppets! Do I really need to explain why a video with the Muppets in it rates being video of the day? They're the greatest bits of felt and feathers known to man and I loved them as a kid and I still adore them. OK Go are good too! The video is for their take on the "Muppet Show Theme Song." The song is from the album, Muppets: The Green Album which was released yesterday, August 23. Check it out the bottom of the post. Also below, for your listening pleasure, we have for you in our MP3 Grab, "All Is Not Lost" (Keys N Krates Remix). The song, written by Jim Henson and Sam Pottle, opened and closed "The Muppet Show" for five seasons in the UK and US, from 1976-1981. The new track was produced by OK Go and mixed by Dave Fridmann (The Flaming Lips, MGMT). Says singer Damian Kulash, "I'm so excited about working with the Muppets that I can hardly sleep. Collaborating with your idols is a huge thrill no matter what, but when your idols are fictional characters it seems downright impossible. The 10-year-old me was pretty good at imagining outrageous futures, but this surpasses even his capacities." Kermit the Frog adds, "The Muppets have performed this song lots of times, but not like this. OK Go never does anything the way you'd expect it. Damian, Tim, Dan and Andy like to mix things up and get a little loopy. I think they were Muppets in a previous lifetime." The music video was directed by Kirk Thatcher, who previously directed two Webby award-winning videos for the Muppets, "Ode to Joy" (over 15 million YouTube views) and "Muppet Bohemian Rhapsody" (over 21 million YouTube views). It celebrates this year's Muppet extravaganza, which culminates in the November release of the Muppets' seventh full-length feature film, Disney's "The Muppets."